We are always looking for one-time or regular contributors for ANOBIUMLIT.COM. – Reviews: of books, of music, of movies, of events, and most importantly, of backyard BBQs. – Visions: of weird, web-based visual art and esotera. – Monologues: which is to say, op-eds, analyses, essays, narratives, experiments, and everything else. – Interviews: with musicians, artists, writers, Joe Plumbers, etc. – Miscellany: whatever doesn’t fit in the other categories. – A featured section on the Web Contributors page as well as the home-page, and also a byline for all of your pieces. – Free review copies of certain new books and materials. – Passes and invitations to events. – The opportunity to participate and make your mark in the development of the Anobium image. – The possibility of being included in Anobium print editions. – Have aesthetic and literary tastes similar to ours. – Write at least two or three posts a month. – Have a social media presence, or awareness of social media nuance. – Write with an informal, non-traditional, unique style. – Have unique ideas for articles, publications, initiatives, and other suchlike. 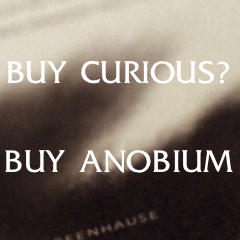 E-mail us at editor@anobiumlit.com so we can get the gears moving. We’re always looking good ideas and warped brains.